Final exams start up this week, which means students are working hard to hand in final projects and study for tests before they head into the spring/summer semester or the end of the school year. 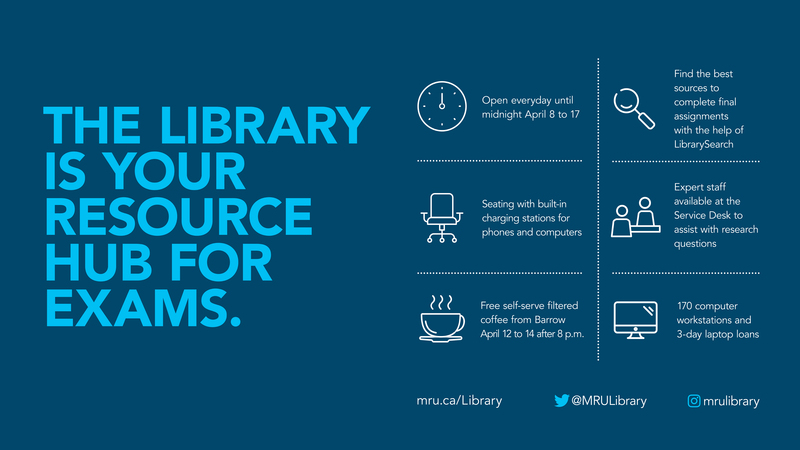 The Library is pleased to extend Library hours to midnight April 8-17 and provide free Barrow coffee April 12-14. This is a busy time of year. Please know that there are several ways you can lean on the Library to help you succeed during exams. LibrarySearch allows you to get access to all Library collections, including databases, journals, articles, and books with a few clicks and a search term. Whether you’re on campus or doing research from home, students can find sources to help support class assignments. 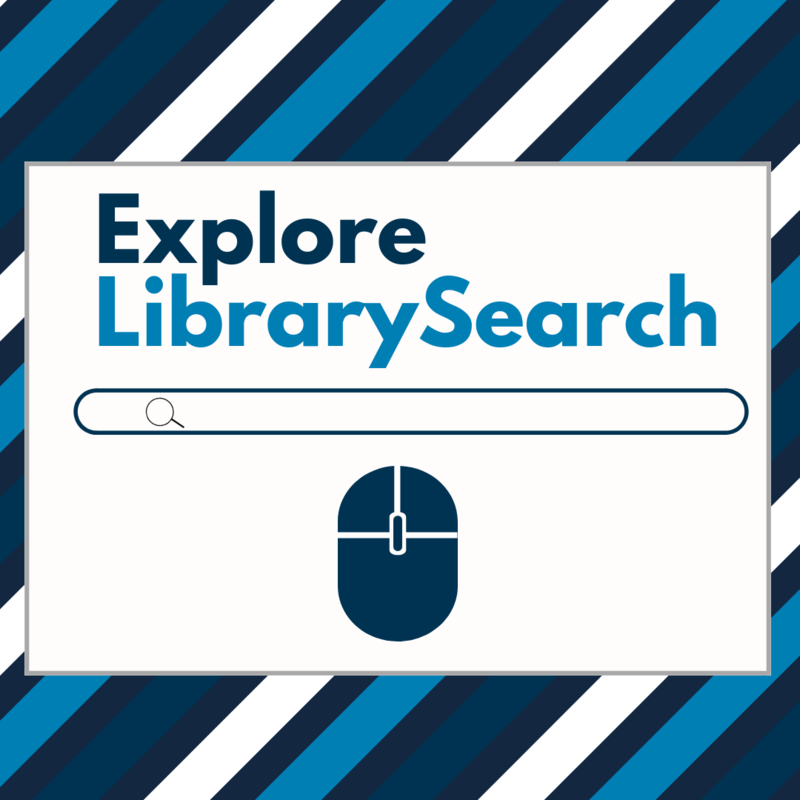 Quick tip: Make sure to log in while using LibrarySearch to access special features to improve the search experience. Subject Librarians are basically research experts for disciplines covered by programs and faculties at Mount Royal. Students are encouraged to book an appointment with a Librarian if they need focused help with research assignments. If you’re studying late in the Library and simply have a question about LibrarySearch or need advice on the best way to find a source, stop by the Service Desk and get the help you need. 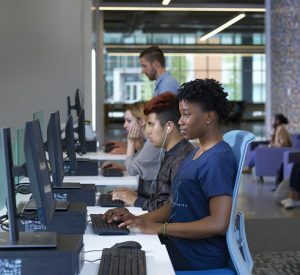 We offer 1,700 seats and 170 computer stations for students to access while studying in the Library. All four floors offer a variety of seating options that include booths for group sessions, pods for solo study, soft seating, study carrels, quiet reading rooms, and so much more! Many of the seats are also powered, which means students can plug in and charge devices while they work. 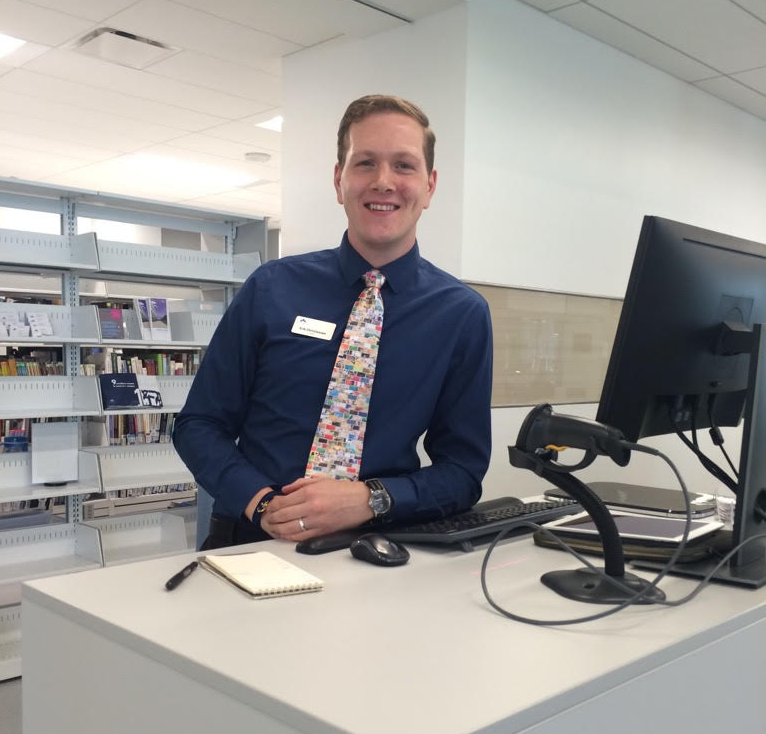 Quick tip: Cell phone chargers are available to borrow from the Service Desk on the main floor of the Library. Final exams are approaching, which means students are busier than ever preparing themselves for the end of semester. Long Night Against Procrastination (LNAP) is the go-to event on campus that helps set students up for success with academic workshops, essay writing and math support, research tips from Librarians, as well as yoga, meditation, and interactive games to encourage self care during this stressful time of year. 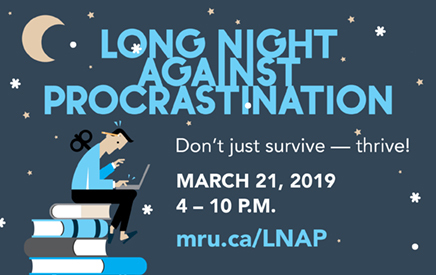 Join us for LNAP winter 2019 in the Riddell Library and Learning Centre on March 21 from 4pm-10pm. LNAP is a renowned initiative that is typically hosted by writing centres at post-secondary institutions around the world. The idea to host a full evening dedicated to guiding students towards resources meant to help them throughout their course work first kicked off in Frankfurt, Germany in 2010. Along with specific activities to help students get back up to speed with course work, student attendees will also have a chance to win $250 worth of gift cards to on campus services. 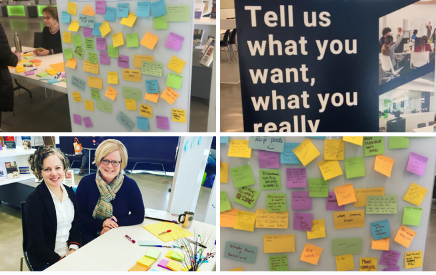 The more drop ins and workshops you attend, the more ballots you can collect to improve your chances of walking away with the giveaway. 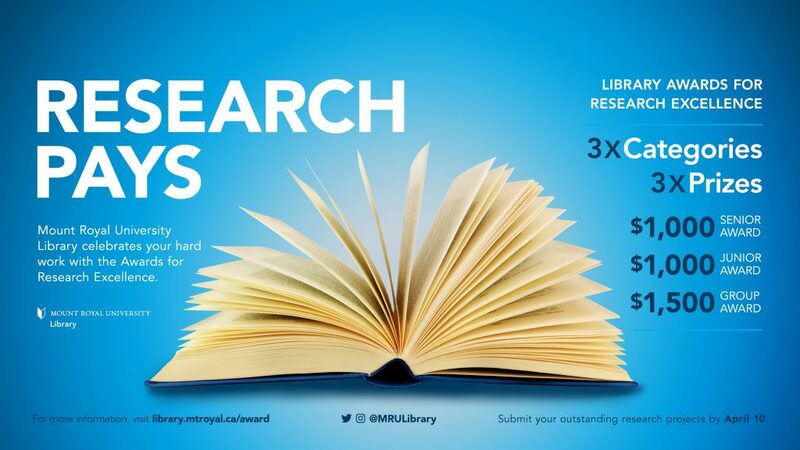 Check out the full lineup of sessions at mru.ca/LNAP.